Identification: Gilbert (1964); Becker (1983); Page and Burr (1991); Etnier and Starnes (1993); Jenkins and Burkhead (1994); Pflieger (1997); another commonly used name is Notropis chrysocephalus. There are two distinct subspecies, L. c. chrysocephalus and L. c. isolepis (Gilbert 1998). Native Range: Great Lakes and Mississippi River basins, from western New York and southeastern Wisconsin south to Alabama, Louisiana, and eastern Texas; Gulf Coast drainage from Mobile Bay, Georgia and Alabama, to Lake Pontchartrain, Louisiana (Page and Burr 1991). Table 1. States with nonindigenous occurrences, the earliest and latest observations in each state, and the tally and names of HUCs with observations†. Names and dates are hyperlinked to their relevant specimen records. The list of references for all nonindigenous occurrences of Luxilus chrysocephalus are found here. Means of Introduction: Unknown; possible bait bucket release. Status: Established in West Virginia. Remarks: There is some uncertainty concerning the native versus nonnative geographic distribution of this species. In their summary table on the distribution and status of West Virginia fishes, Stauffer et al. (1995) considered this species to be native to the Kanawha River drainage below the falls. Gilbert (personal communication) concluded that the population of L. chrysocephalus isolepis in the Escambia River drainage of Alabama and Florida to be introduced. The same case has been made for other minnow species recently found in the Escambia, including Nocomis leptocephalus and Notropis baileyi. Gilbert (1992) noted that these species were absent in all early samples taken from that drainage. In their summary table on Alabama fishes, Mettee et al. (1996) listed this species as native to the Conecuh (Escambia) River drainage. 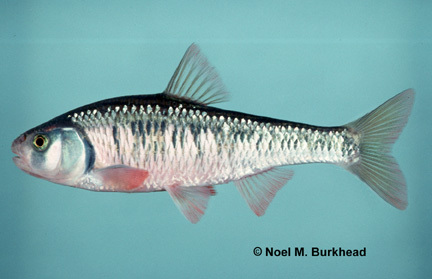 Although not considered a true introduction in our treatment, Pflieger (1997) noted that the species had disappeared from certain streams in Missouri but it became re-established, possibly the result of an undocumented reintroduction.